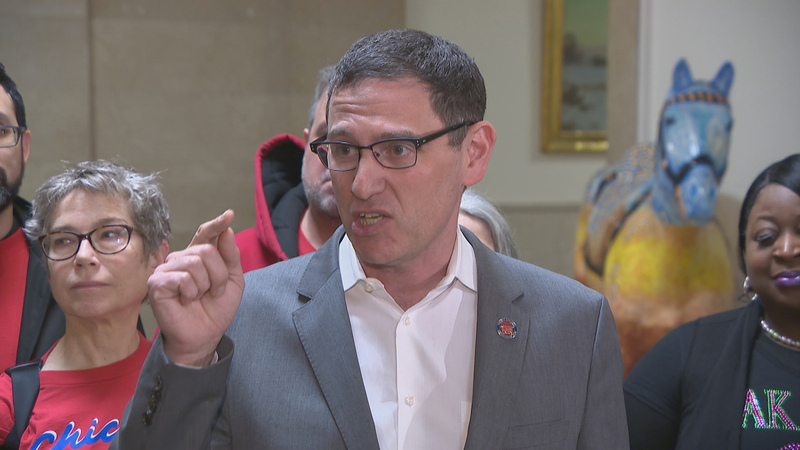 The head of the Chicago Teachers Union is telling members to start setting aside at least a portion of their upcoming paychecks in anticipation of a possible teachers strike this fall. CTU President Jesse Sharkey last week suggested the union’s rank-and-file “start saving” at least 10 percent of each paycheck “to make sure we can stand strong on the picket line” in the event contract negotiations with Chicago Public Schools break down. Union leadership turned in a 75-point contract proposal to City Hall earlier this year, kicking off the monthslong bargaining process with the city and CPS leaders. Those demands include a 5 percent pay raise for its members, along with counselors, nurses and librarians in each school, and decreased class sizes. The union’s current contract is set to expire at the end of June. Complicating matters is the upcoming turnover in City Hall, as Mayor Rahm Emanuel prepares to leave office in May after serving two terms. The CTU has endorsed Toni Preckwinkle in next month’s mayoral runoff election against Lori Lightfoot – a choice that was made at least in part because “she gives us better leverage in a contract fight,” Sharkey said. “Regardless of who wins the mayor’s race on April 2, we have to be ready for anything,” he wrote in the memo. Despite the upcoming election, a CTU spokeswoman said bargaining won’t be put on hold until the new mayor is sworn in. The CTU is also under new leadership this time around after Sharkey replaced influential union President Karen Lewis, who retired last year to focus on her health. Despite the financial warning, Sharkey did express some optimism about the negotiations. He called schools chief Janice Jackson a “different CEO” than Jean-Claude Brizard, who led CPS during the 2012 strike, or Forrest Claypool, who was in charge during contentious negotiations that nearly led to another strike in 2016. The CTU last year merged with the Chicago Alliance of Charter Teachers and Staff, and already has won pay raises through a pair of smaller-scale strikes in recent months – including the nation’s first-ever charter school teachers strike at the 15 predominantly Latino Acero schools late last year.